Hookedoncraft challenges: Blog Candy Giveaway! To celebrate the launch of Hookedoncraft's challenge blog we are offering a Blog Candy giveaway. Once we reach 100 followers we will do a random prize draw and the lucky winner will receive all this! 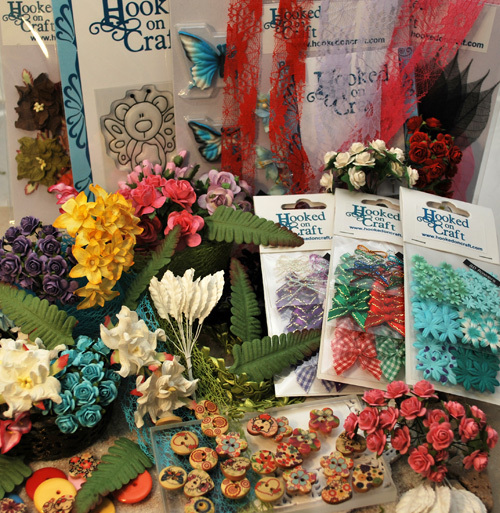 This prize pack is packed full of Mulberry paper flowers, Mulberry paper leaves, Little Bows, Buttons, Stamps, assortment of ribbons, 1 acrylic block and Decorative trinket pins. To enter this prize giveaway all you have to do is become a follower, enter your name and blog link at the bottom of this page and keep your fingers crossed! Once this enormous prize has been given away we will start doing challenges of our own. These challenges will be held fortnightly to allow you enough time to create your masterpieces and enter the challenges.There will be sketch challenges, colour challenges, inspiration images and much much more. You don't have to use Hookedoncrafts products but if you do you will earn an extra entry. We will be giving away prizes as well as vouchers to our online store. There will be a random winner but our design team panel will also help me pick the top 3 with links to the winners blogs. If you are interested in joining our design team please email me at info@hookedoncraft.com for more information. If the winner is not found to be a follower we will have a redraw. I am so happy to find this blog and I'm your 33th follower! Thanks for the chance to win! I am a new follower, thanks for the chance to win some awesome goodies. Great Candy - thanks for the chance to win. I've put a link to your candy in my sidebar for you. your candy is so pretty. i love all of the items. so colorful. Wow fab candy thanks for the chance to enter :) i have put your candy in my sidebar, I can't wait to play along with your challenge. Seu doce é lindo...Ja sou seguidor e tbm estou de dedos cruzados para ganhar este lindo doce. Obrigada pela oportunidade de poder participar. What a beautiful prize! thanks for the chance to win! Ooh a new challenge - very exciting! Look forward to the 1st challenge! I love it when new challenge blogs open.. how exciting.. I am follower and can't wait... I have posted your candy on my rightside bar here... ... thanks for the chance..
Great giveaway! Thanks for the chance! Look forward for the first challenge!